In the GT series, Toyota is often a treat to play for American gamers, as its lineup feature cars not available in the United States. In GT3, those models include the Altezza, the Vitz and the Supra. When the Celica undergoes a full model change, what attracts attention is its novel body design. The current seventh- generation Celica which appeared in September 1999 was designed at Catly, one of Toyota's overseas design center. Look closely at its distinctive front end and you will notice that it is not simply eccentric, but rather it achieves a form that anticipates automobile design in the near future. The Celica takes a leadership role in pulling along Toyota's automotive design. The two available powerplants are the 1ZZ-GE which is a refined version of 1ZZ developed for the Vista, and the 2ZZ-GE. The cylinder head of the 2ZZ-G which is the high-performance type is equipped with a VVTL-I (continuously variable valve timing & lift mechanism) tuned by Yamaha. This is a high-performance engine that spits out specs of 190 ps/18.4 kg-m even being a naturally aspirated 1.8-liter. Moreover, we cannot overlook the fact that the engine itself is roughly 30 kg lighter than the previous model. This contributes to its quick handling and the suppression of the nosedive phenomenon on braking. This car is not simply a specialty car but rather it also satisfies the needs of people who are in pursuit of a pure driving experience. 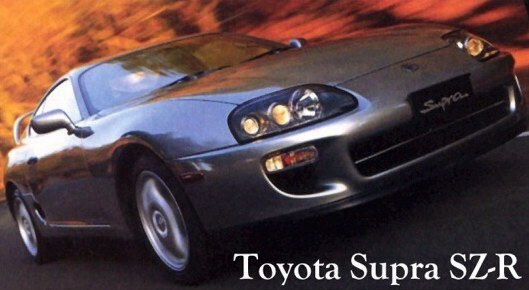 After a minor change in August 1997, Toyota's top-of-the-line sports car, the Supra, was further refined in many of its details. The most important of these is the BEAMS engine equipped with a variable valve timing system (VVT-i). The VVT-I system has been adopted in many recent Toyota cars, being a system that continuously varies the valve drive timing depending on the speed and acceleration for finer control over the engine. The Supra can be driven quickly by not only experienced drivers but also general drivers without such a high level of driving skill. That broad appeal to drivers has been one of the charms of this continuously improving car line. The MR2 powerplant is an inline 4-cylinder 2-liter naturally aspirated engine. Being equipped with the variable valve timing system (VVTi), its maximum power reaches 200 hp. This power is slightly less than that of the GT-S, making it possible to improve chassis performance. With an astounding 22 models in their lineup, Toyota rings in with the largest number of cars in GT3. Everything from their classic `85 Sprinter Trueno to their wild and exotic `99 GT ONE Road Car, Toyota has you covered.